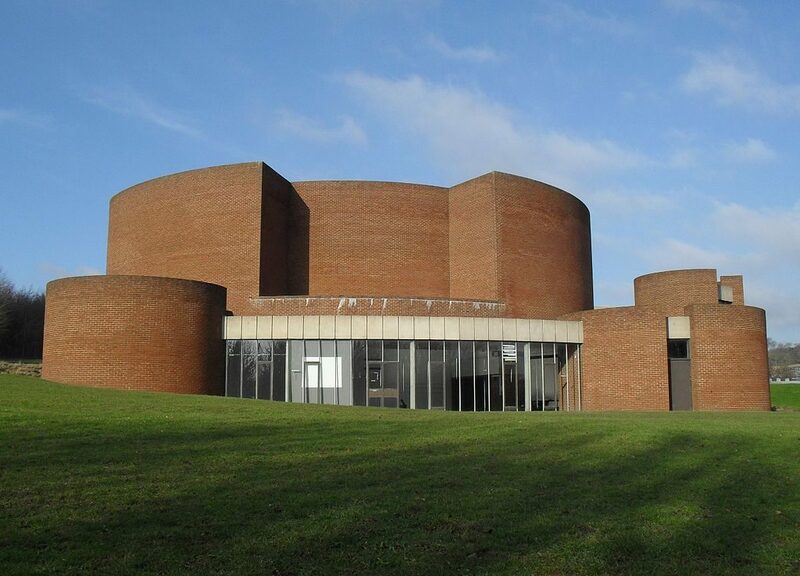 Attenborough Centre for the Creative Arts is an interdisciplinary arts hub connecting University of Sussex with Brighton & Hove and the wider national and international arts communities. The centre will present a programme of contemporary arts – including music, theatre, dance, live art and digital practices. The nearest station is Falmer (approx 5 minutes’ walk to the Attenborough Centre). The train takes nine minutes from Brighton and seven minutes from Lewes. Trains run very regularly during the day (about every 15 minutes). The last train leaves Falmer at 23:45 for Lewes and 00:25 for Brighton. See National Rail for further information. From the train station follow signs to University of Sussex – walk under the underpass and follow the footpath until you reach a zebra crossing. Turn left here until you reach Gardner Centre Road on your right. Turn right up Gardner Centre Road to find the main entrance of the building. The Attenborough Centre is the building with round red brick towers. The number 25 and 25X bus brings you from central Brighton all the way to University of Sussex campus. Alight at the “Sports Centre” bus stop and you will see the Attenborough Centre through the trees across a lawn. There is a night bus. Route N25, which runs to and from the campus to the centre of the city, is hourly from 12am to 5am all week. The fare is £2.20 each way. If you miss the night bus there is a special discount fare using Streamline Taxis (Tel: 01273 747474) from the centre of Brighton to the University which costs £12. There is car parking available at the Sports Car Park (P5), Sussex House Car Park (P4) and Biology Road Car Park (P3), all of which are within a couple of minutes’ walk from the Attenborough Centre. The routes from the car parks to the Attenborough Centre are accessible for people in wheelchairs. The entrance to the venue is on the level. Front-of-house staff will be in the foyer area as you arrive and will direct guests and answer questions as required. Guests who will be using the accessible viewing area can arrive at an earlier time, if required, in order, for example, to avoid moving through crowds. Please notify the box office at info@attenboroughcentre.com. The box office is located immediately on your left-hand side as you enter through the front doors. Guests collecting tickets at the box office will need to show the credit or debit card that they booked with and the email confirmation of booking that was sent at the time of booking. Proof of disability is not normally required, although we will monitor ticket sales and take any other action to prevent abuse of the concessions system. Accessible male and female toilets are located on the ground floor, just off the entrance foyer, next to the Jane Attenborough Studio. Turn left as you enter the venue through the front doors and the toilets are on your right-hand side. Both sets of toilets have baby changing units installed in them. We welcome assistance dogs. We recommend that guests inform the box office in advance and provide proof that any dog is registered with an organisation that is a member of Assistance Dogs UK.